Champion amputee sprinter Oscar Pistorius is able compete against the world's best able-bodied athletes while researchers try to determine whether his prosthetics give him an unfair advantage. But Nick Davies, spokesman for the Monaco-based International Association of Athletics Federations, said discussion of Pistorius competing in the Olympics was premature, noting the 20-year-old sprinter had not yet achieved the kind of times that would allow him to qualify. "Oscar can compete. No one can stop him running," Davies said Friday. Pistorius's manager Peet Van Zyl, said he had heard from Davies over the weekend, and called his overture an about-face. In March, the IAAF introduced a new rule banning any runner deemed to benefit from artificial help from competing. 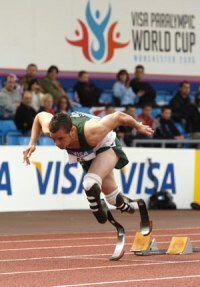 That had widely been interpreted as scuttling Pistorius's hopes of being the first disabled runner to compete in the Olympic Games, with his sights set on Beijing in 2008. "They have changed their stance," Van Zyl said. "This is a totally different stance from when they introduced the rule change." Van Zyl said now had to get Pistorius into "tiptop" shape for his international debut. The 20-year-old Pistorius, who was born without fibula bones in his lower legs and was only 11 months when limbs were amputated from below the knee, said he hadn't yet been able to process the news. "I have just been putting all my energy in training," he said in an interview Thursday, fielding an international call on his mobile about whether he would be taking part in an upcoming competition in Italy. Striding around on his curved blades, which only make contact with a few centimeters (inches) of ground, Pistorius, looking like a futuristic Pan, is as comfortable and as light-footed as a gymnast. "I want to go forward and I can't if I have to compete only at a local level. The way to go forward is by running against people faster than me," said Pistorius, dubbed "Blade Runner" because of the shape of the feet at the end of his carbon fiber legs and "the fastest man on no legs." Davies said the March rule had been misinterpreted. It prohibits the "use of any technical device that incorporates springs, wheels or any other element that provides the user with an advantage over another athlete not using such a device." It was aimed at sophisticated gadgets manufacturers add to the shoes of top athletes. Banning Pistorius "was never the purpose of the rule. It was never the intention. It would have been unfair," Davies said. Davies said the new development was that the organization was going to take it upon itself to work with Pistorius to conduct scientific research and tests on the runner and his prosthetics. Davies said one of the aims was developing criteria on prosthetics and other aides. "Perhaps certain prosthetics will be allowed and others won't," he said. "We need to establish the facts and we want to do this together. We have nothing against disabled athletes, on the contrary, but we need to be fair," Davies said, saying Pistorius's case was taking the federation into new and unfamiliar territory. "This issue is so new. Oscar is an exceptional athlete, maybe unique. He is on the very edge of disabled and able-bodied sports. No one else has ever done that, that is why we are in the dark," Davies said. Pistorius, a business student from Pretoria, is adamant his blades give him no advantage or extra energy and that his stride is no longer than anyone else's. "They are passive devices. If anything I am at more of a disadvantage. I have no ankles. There is less blood flowing through my body. I have no calf muscles so I have to use more muscles to do what they would," he said. "These exact feet have been used for 14 years and there has never been a paralympic sprinter to run my times." He says his success on the track is down to talent and training. Pistorius has clocked 10.91 seconds in the 100 meters, 21.58 seconds in the 200 and 46.56 seconds in the 400. Those are world records for disabled athletes, and he finished second in the 400 meters at the South African Championships the able-bodied meet in March. Pistorius' times are still short of the 46.3 seconds in the 400 meters that he needs to qualify for the Olympics, but he hopes he can improve before July 2008 deadline for meeting qualification requirements. Davies, of the IAAF, said Pistorius might have a more realistic chance at qualifying in a relay events, which would only require him to be among his country's top six athletes. That decision would be made by Athletics South Africa, "and it is a tough one for them," Davies said. Linda Ferns, general manager of Athletics South Africa, would like to see a scientific resolution to Pistorius's case and said she was aware the IAAF was undertaking research. Pistorius took his first steps on a pair of fiberglass limbs pegs. Since then he has gone on to play competitive rugby, water polo and tennis at a school level. He only took up running in 2004 after a rugby injury. When he's not wearing the prosthetics designed for sprinting, Pistorius has flesh-colored prosthetics with well-defined calves to fit his muscular frame that are as battered and bruised as those of any other active young man. There is a tear and a burn mark from a motorbike exhaust pipe and the shins are scratched and scuffed. In action, the blades at the end of his racing legs blur, and a distinctive thwacking sound comes from the track. "He is unique. Because he learnt to walk on prosthetics from a young age he has got balance," said renowned South Africa sports scientists Tim Noakes. "It is remarkable that he can maintain that balance at the speeds he reaches. He can use the equipment effectively. I have very high regard for what he has achieved." Noakes, who has consulted with Pistorius but has no formal relationship with him, believes that disabled athletes could be competing in the next Olympics. He is more concerned about the high amount of doping in sports and feels these aides don't give athletes as much, if any of an advantage, compared with taking steroids. Pistorius's ambitions to make Beijing are not about winning or making any grand points about disability. He wants to take part because of the very spirit behind the Olympics. "It would be as special for me as the next guy."